Is The S&P 500 Index Just In A Correction? After stalling out at the 1,422 level on April 2nd (albeit an interesting point that 1,422 is a numerical anagram of that date: 4/2/12), the S&P 500 Index (SPX) has seemingly been in a consolidation phase. This post-Q1 phase has been characterized but sharp intraday price swings and a rise in the CBOE S&P 500 Volatility Index (VIX) since its 13.66 low was scored on March 16th. Fundamentally, “earnings season” has now begun with some positive surprises having already been announced. Forward guidance as well as geo-political events, however, have kept investors in a defense posture, particularly after coming off such a stellar first quarter performance. 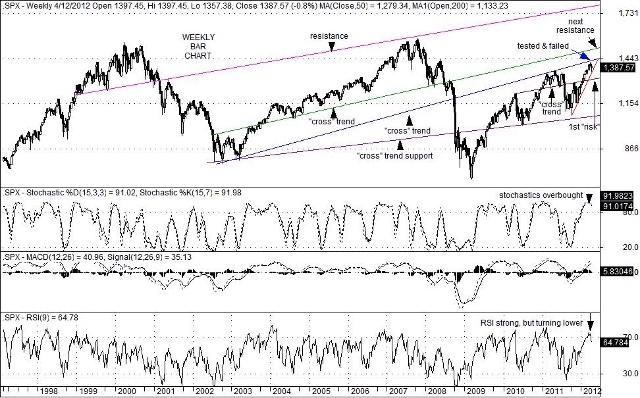 Overbought technical conditions on weekly charts combined with last month’s disappointing employment report may have also forced many investors to look for better points of “entry” before committing cash. While the vagaries of economic reports out of Europe swinging both bullishly or bearishly at times, there is reason to expect global growth to be limited at best. As a result, investors continue to search for reasonable “entry” points on specific company names or sectors. When looking at the S&P 500 Index itself, it appears that the first key “cross” trend line support now sits at 1,319, but rises gently over time. If that level is reached quickly, however, current overbought conditions will not have had enough time to diminish very much. That leaves the door ajar for a more pronounced adjustment lower, unless fresh positive fundamental events become the focus. As the “sell in May and go away” mantra draws closer, the bigger issue at hand is whether the 1,319 level can hold as support. Lower gasoline prices, a string of better-than-expected weekly initial jobless claims combined with a slew of upbeat earnings guidance would clearly help. Worries over the slowdown in China, the financial problems of both Spain and Portugal, and the expectation the state and municipal job layoffs (as their collective budget deadline of June 30th approaches) could cause investors to trim positions and “wait and see”. An increase in political President election-year rhetoric could also be cause for a pause. Thus, a solid break below key trend line support at the 1,319 level on the SPX could trigger a more pernicious response from investors. This entry was posted on Thursday, April 19th, 2012 at 12:16 pm	and is filed under The S&P 500 Index (SPX). You can follow any responses to this entry through the RSS 2.0 feed. You can leave a response, or trackback from your own site.